If you are planning a wedding, an anniversary, birthday celebration, or family reunion, or if you are looking for a place to hold a business or personal meeting, consider one of the buildings at the Tonganoxie Community Historical Society Site. 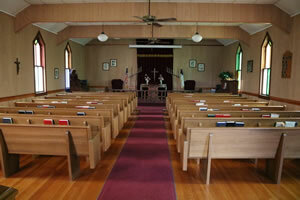 The historic Reno Methodist Church is a unique and quaint location for a wedding. It will accommodate up to 100 guests in the wooden pews and provides a picturesque background for your special day. The Fellowship Hall has a full kitchen and two bathrooms, and is a perfect location for luncheons, dinners, or meetings. The fellowship hall accommodates a maximum of 50 people. The Fairchild/Knox Hay Barn provides ample space for larger groups, accommodating up to 120 guests. The barn has a fully equipped kitchen and two restrooms. There are tables and chairs on hand for approximately 70 guests. Additional equipment is available. Non-profit groups from our community may use any of the buildings one time a year free of charge. All buildings can be rented and must be reserved in advance. Reservations and payment will secure the rental. Photographers find the museum site a picturesque setting for portraits of families and individuals. Photographers are welcome to use the premises during our normal hours. There is no charge for use of the premises, although donations are always appreciated. Contact the museum director for more information.